© Bug Art. All rights reserved. 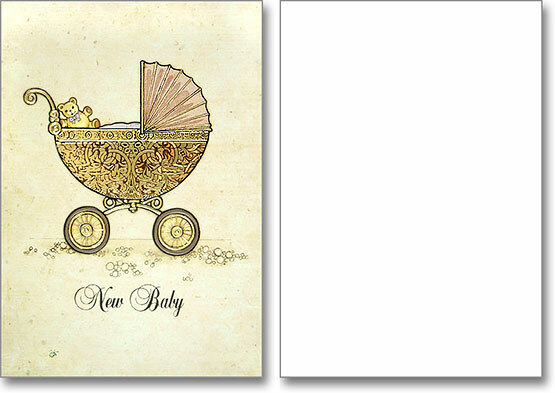 An embossed, gold-foil carriage denotes the arrival of a new baby. Jane Crowther is the founder and lead designer at Bug Art, based in Nottingham, England. Introduced in 1991, the company's first line featured a cute little bug character. Other lines, many with value-added finishes such as metallic foil embossing, glitter and spot varnishing, have steadily been added. Winner of numerous design awards, Bug Art has sold millions of its cards all over the world. With a classic yet contemporary look, Bug Art cards have unusual longevity for the greeting card market, with many of the original designs still available.